A second-year student in the University of Southampton's School of Art has scooped the silver trophy in a prestigious international art competition. 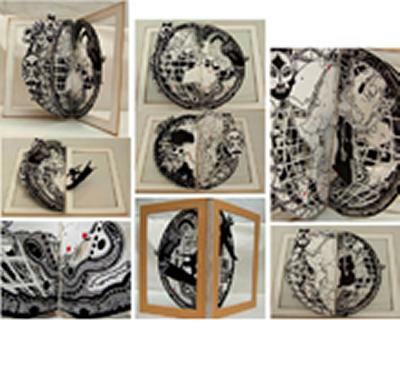 Ann Dadd, a mature student who is studying Graphic Arts at Winchester School of Art, was the only UK entrant to make the finals of the Danfoss Art Award 2008 which is open to students at recognised schools of the visual arts, design, sculpture and architecture around the world. As well as the silver trophy, Ann received 3000 Euros and her artwork was included in a book of entries for the Danfoss Art Award. For her entry, Ann created a hardbound book with a picture frame cover allowing a glimpse into the inside pages, based on the idea of an old atlas but with a modern viewpoint. The book has fine-liner and marker pen illustration and longitude and latitude areas cut out with a scalpel. Ann explains: "Depending on where you live in the world, your age, and your religion, your own culture affects your personal view of the world you live in. I wanted to create an atlas that showed one country's culture from another country's viewpoint, or one person's culture from another person's viewpoint. "We only see a partial glimpse of our neighbour's culture and this is reflected when looking through the pages of my cultural atlas - depending on where you decide to stand, your view of this piece of art changes. Many of the world's problems occur because we don't understand and appreciate other cultures. In the end, we are just one people, one world," she adds. Professor Bashir Makhoul, Head of WSA, comments: "I'm delighted at Ann's success in this international art competition, which is another example of the high quality and talent of the students studying here." The Danfoss Art Award is an international art competition and prize open to art, architecture and sculpture students around the world. The Award is arranged by the Danfoss Group, which develops and produces mechanical and electronic products and controls, as a way of communicating its company values.